Do you have a young daughter Kindergarten through second grade that loves to read? Katie Woo may be a great book series for her. Even though my oldest is now in 5th grade and my youngest is only 15 months but I still wanted to check out these books as they are timeless and will be great for us in a few years. I was grateful when I was asked to review the Katie Woo books. Katie Woo is a spunky little girl with tons of personality. I can’t see any little girl not liking her. She loves to play dress up, and other games. These books are so cute. I had help from a friend of mine and her daughter. The little girl is in kindergarten and just learning to read. She really loved them and asked if she could keep one. How could I say no to that? Of course I let her have one of them. I’m thinking that her mom will be buying her some for Christmas. They have great themes and perfect for girls who love dress up and playing. They also have an app that you can download where you can plan a party. It’s very fun and interactive. Their website is full of activates that you can download or watch videos. The Katie Woo early chapter books each feature four stories and colorful illustrations throughout and are perfect for explaining life changes, family celebrations and growing up. The fun, light-hearted stories focus on Katie in school and the challenges and experiences that life as a first grader brings -- perfect for young girls settling in to school this year. 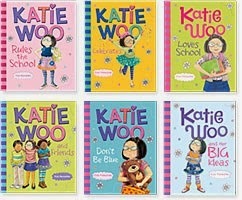 The world of Katie Woo is packed with videos, downloadable activity pages, recipes, and more -- check it all out here at http://www.capstonekids.com/characters/Katie-Woo/. I definitely recommend these books to any little girl who loves to read. Make sure you order yours today and also be a part of the book club. * Katie Woo goodies -- pencils, bookmarks and a poster! I love all the bright colors and pretty illustrations!! So fun! I like that Katie is a first grader and would be easy for my daughter to relate to. Seems like the stories would be fun for her to read independently. I like that the books have a meaning behind them and that my daughter gets into them, because Katie, like her, is in the first grade. Destiny's favorite is Katie finds a job. My daughter could relate to Katie, she loves crazy and silly clothes too! The crazier the better! I like that the stories have good points in them and it is something my daughter can relate too! I love the array of subject for the books, lots of things younger girls can relate to! Plus they are very colorful! I like that girls who read the books can relate to Katie Woo and her adventures! I like that she is a role model. She sometimes makes mistakes, but always wants to make it right! Katie Woo is my little girl's FAVORITE! Thank you for the chance! I love that my niece can relate and she really loves the stories. The illustrations are also wonderful. I entered the Smarty Pants vitamins giveaway. Colorful with good stories behind them. I like the real life situations. I like that she reminds me of my niece! I have 2 challenged girls that have some of the same problems the stories. How fun to learn how to handle/act without others correcting them. It sounds like a great conversation starter for life's lessons. I like that my daughter would really connect with a character that is so much like herself! And that she can learn from these books! I love the pictures and how the books teach lessons all kids should learn, and how easy it is for children to learn to read them. I love the wide variety of topics the books cover!